I recently restored a gorgeous Sansui AU-717 integrated amplifier. This AU-717 was not running properly and was in serious need of some TLC. 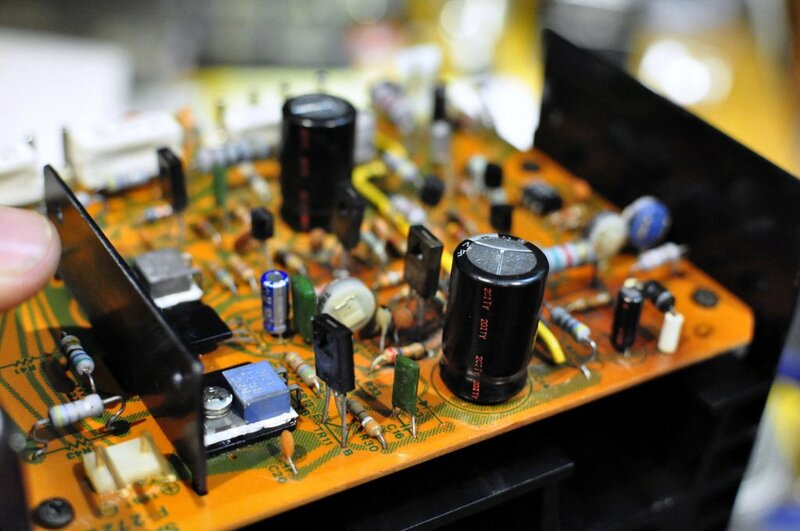 The Sansui AU-717 integrated amplifier is one of those pieces that I just love working on. Sansui designed and built the AU-717 at a time when labour was cheaper. The money went into build quality, parts and layout. 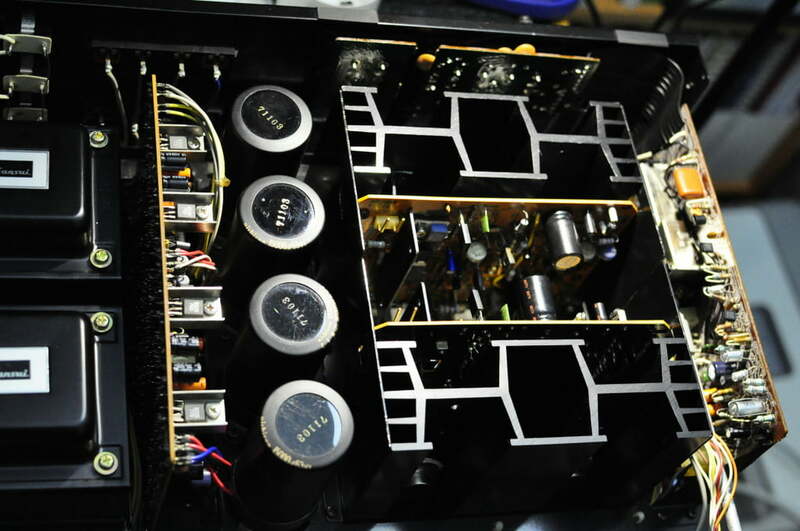 This amplifier is an integrated model, meaning it has a preamplifier and power amplifier in the same chassis. The pre and power sections can be separated if necessary and the whole piece is extremely well laid out. Anyway, This AU-717 was another victim of the Sansui ‘corrosive glue’ problem, more on that later. The weight of this amplifier is amazing for something that was not even top of the Sansui range at the time. 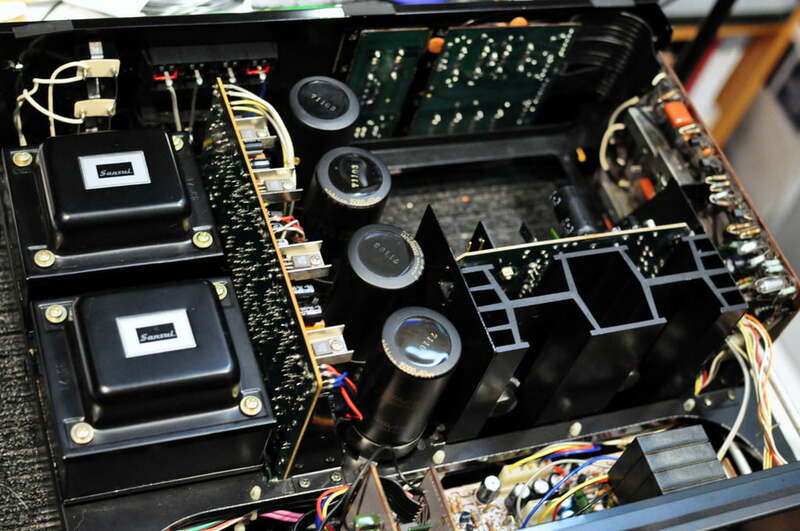 Sansui laid out their equipment beautifully in terms of ease of servicing and sparing little expense. The amplifier contains a really nice dual-mono phono preamplifier, with selectable gain and lots of polystyrene capacitors. The phono preamplifier sits in a separate shielded box, which is a sound way to reduce noise in sensitive high-gain circuits. 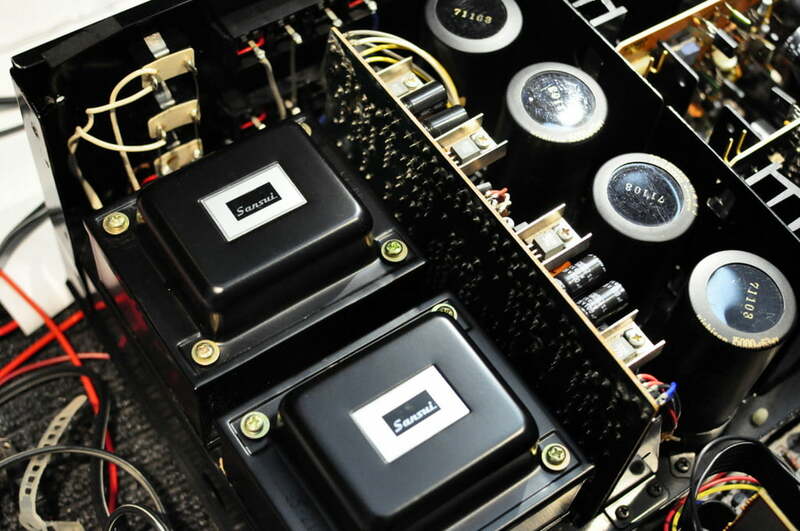 This beast has two separate power transformers – serious in a mid-range integrated amp, and almost unheard of now. And let’s not forget something I tell customers all the time: there is nothing new in amplification. No new inventions have furthered the field and you can buy something like this with great confidence, though like this one, it’s likely to need a decent service and maybe even a few new parts. Cosmetically I have thoroughly cleaned the insides of the AU-717 and you could literally eat out of this beast now. I ordered a new protection relay as the relay was faulty in this example. I also spent some time cleaning potentiometers, trimmer pots and controls and tweaking bias and offset in the output modules. 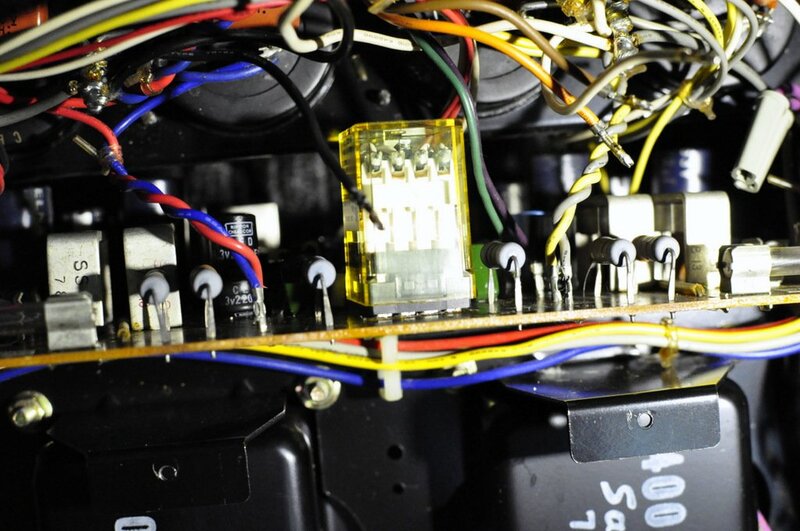 What follows are some pictures, with captions, detailing the work and the various stages needed to get the old Sansui Au-717 back up and running again. 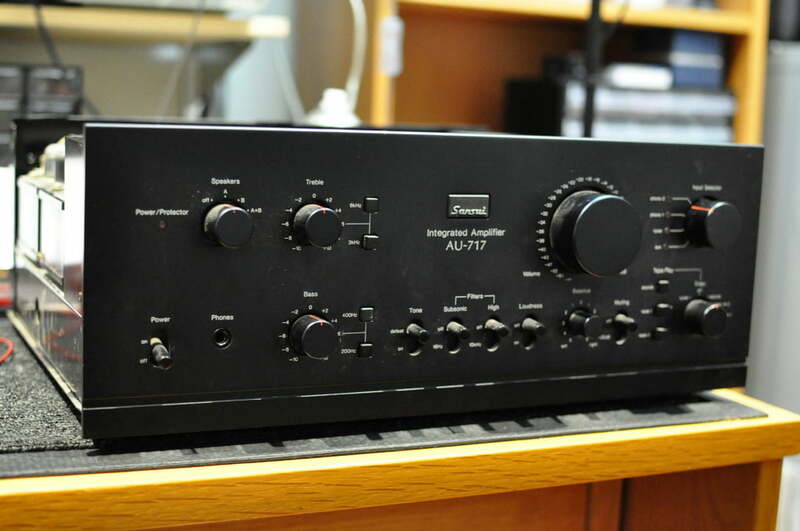 Here is the gorgeous Sansui AU-717, with most of her clothes still on. 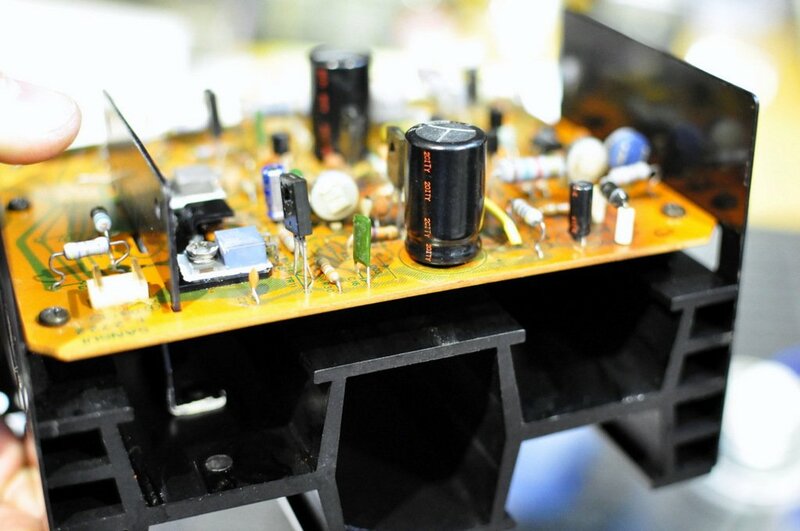 Capacitors, held to the board by corrosive glue, dirt, along with dust and other contaminants. This amplifier will never function correctly until all of this is gone. 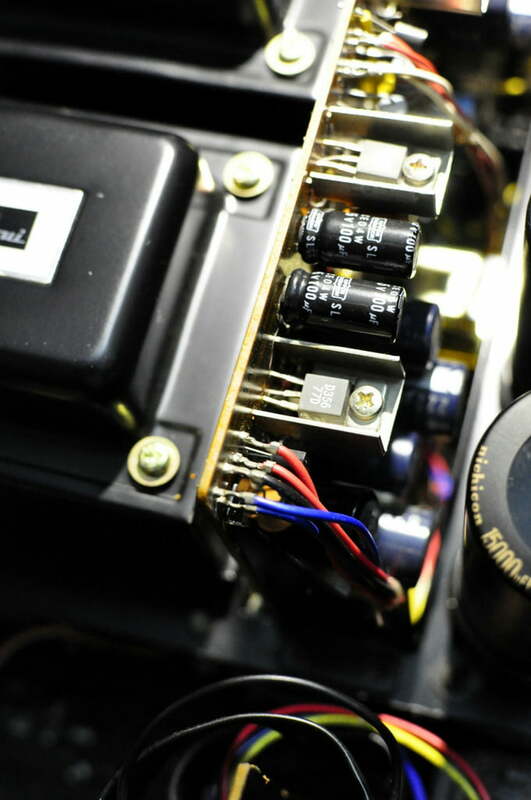 Some main filter capacitors and you can see the output modules and their heat-sinks to the bottom of the picture. These shots are after a very thorough cleaning, using a system I’ve developed for chassis-level cleaning during restorations. Much cleaner already – the difference is night and day. Detail shot of those gorgeous dual transformers and filter capacitor array, now sparkly clean. 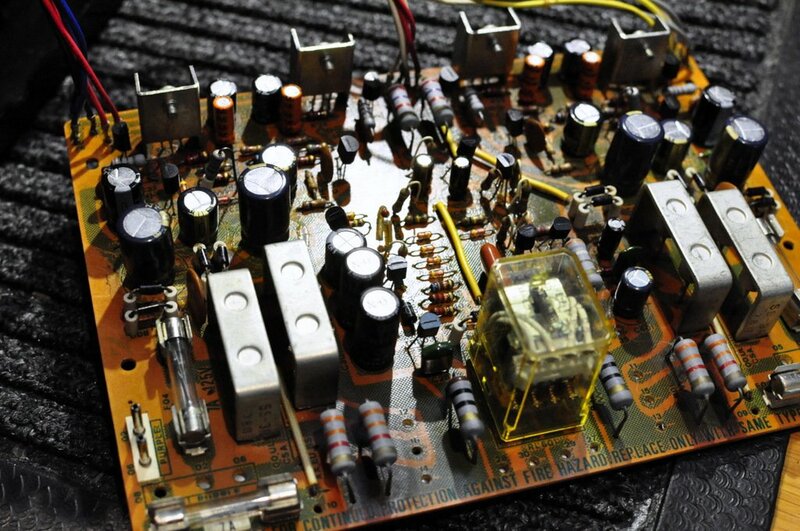 Here, you see the original capacitors, located on the regulator board where I found a lot of this amplifier’s problems. 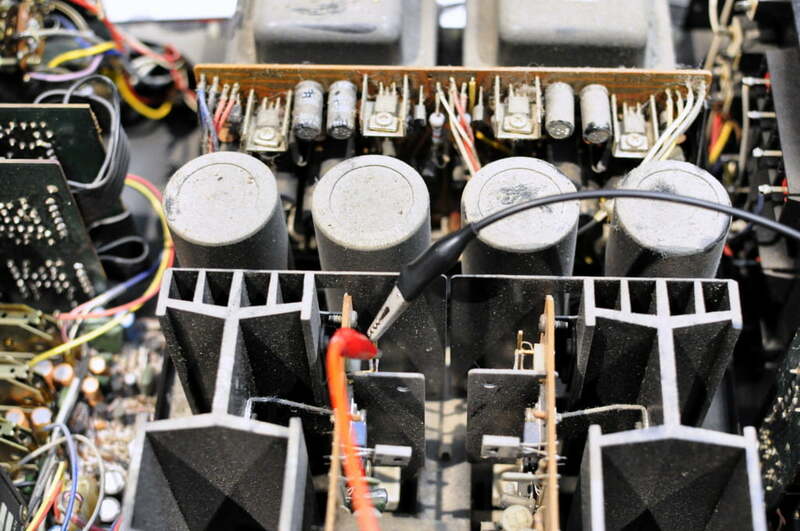 A large part of the restoration involved replacing aged electrolytic capacitors and removing the Sansui corrosive glue from each circuit board. I worked on one board at a time, meticulously cleaning them, removing the old caps, cleaning away the corrosive glue, replacing any affected parts, installing new capacitors and flux cleaning. 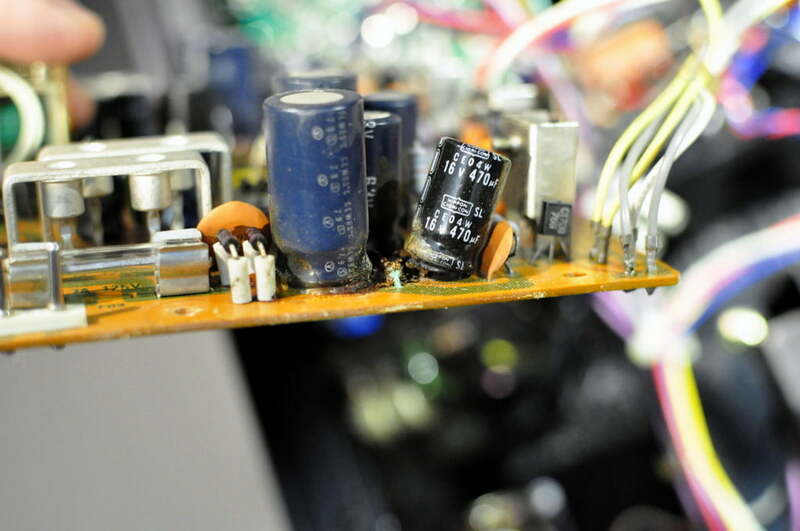 Corrosive glue and leaking capacitors have caused this PSU/protection board to need major repair. 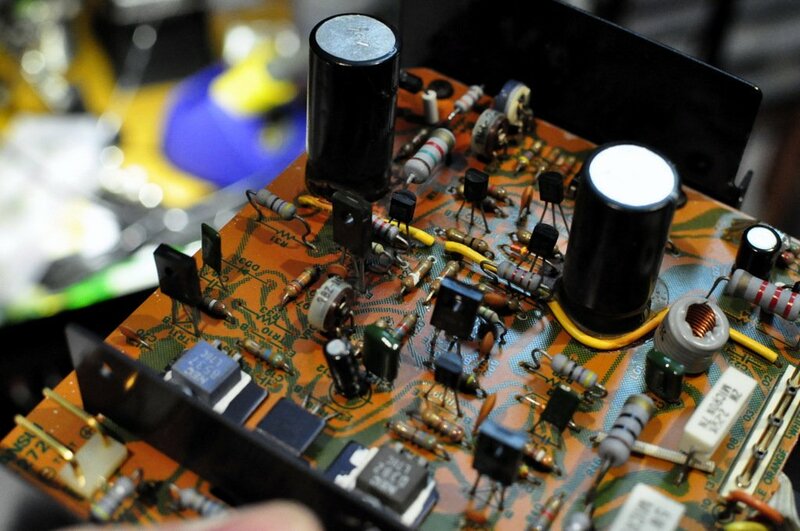 This speaker protection relay was playing up on this particular AU-717. Out with the old, on the right, in with the new, on the left. 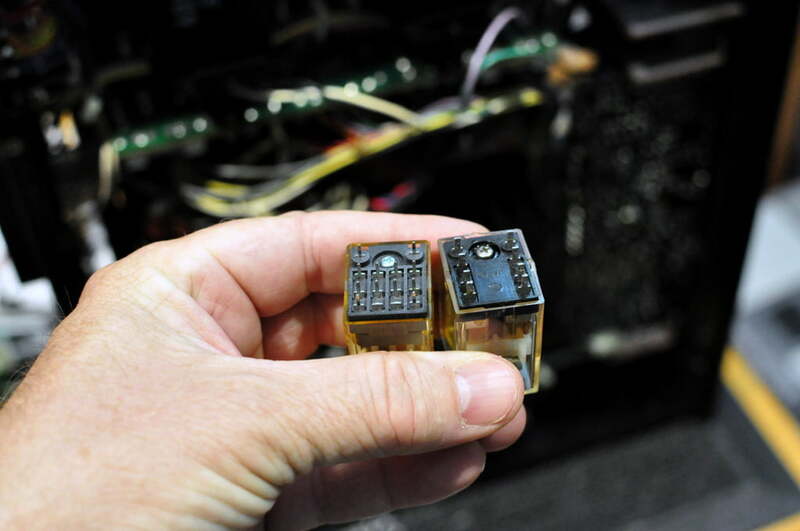 The replacement relay has extra terminals, but these are not needed and don’t affect operation. The repaired and restored power supply/protection board. The new relay is at the bottom of the board. Another view of the repaired power supply and protection board. Here’s the chassis, with one output module removed for servicing. 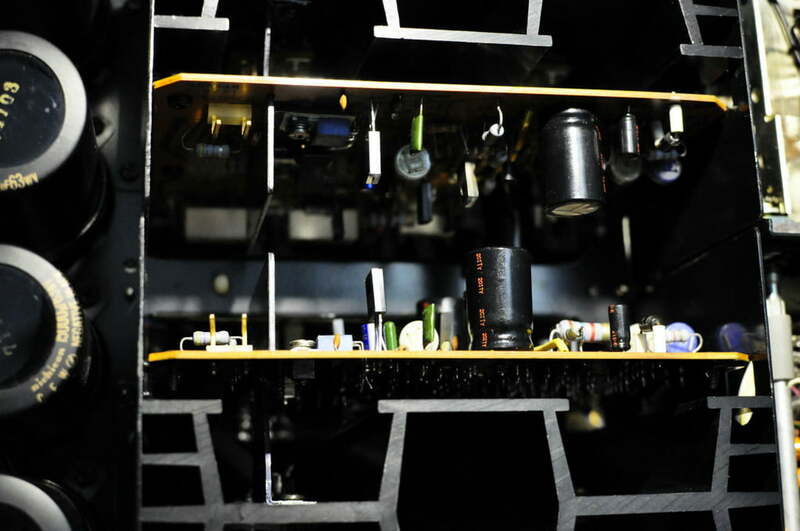 View of an output board, prior to removal of capacitors and cleaning. Another, closer view. 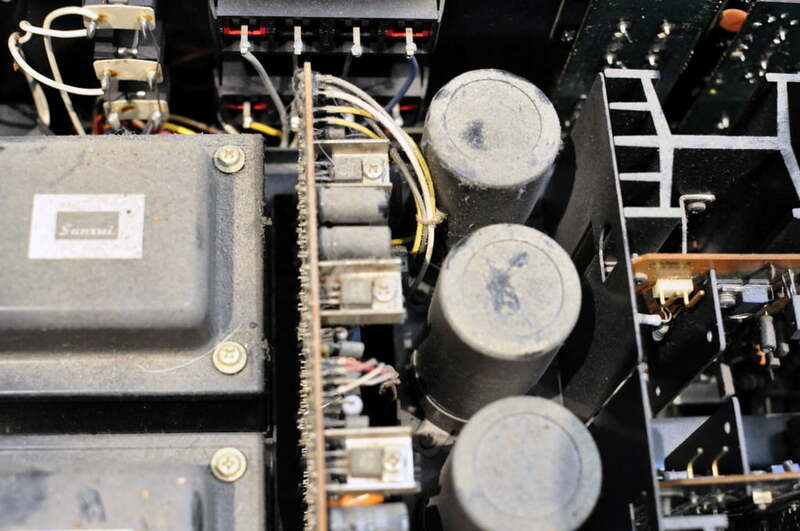 These capacitors will all be removed, the board cleaned and then new capacitors installed. 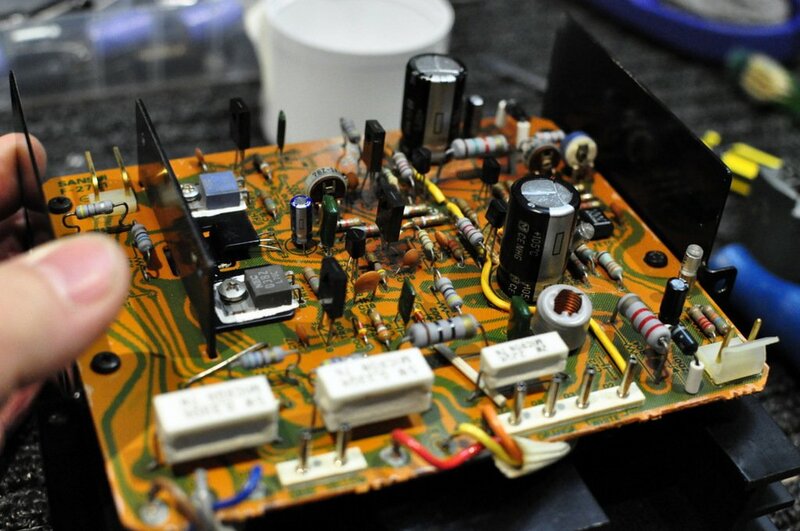 Here we have one of the two output boards, with capacitors removed, prior to cleaning. Every trace of the ‘corrosive glue’ must be removed. Cleaned and restored boards back in the chassis. Ready for final inspection and adjustment of bias and DC offset. Previous PostLatest Turntable Repairs & ServicingNext PostCommon Turntable Question: Why Use Synthetic Bearing Oil? Nice work! Great photos. How did you go about working on the sealed volume pot? Did that present challenges? Thanks for that, I have so much more I need to get up on the site but am too busy with repairs and restorations! This type of potentiometer is not completely sealed as they are in some types of test gear for example. Depending on the pot, one can often gain access quite easily, but one must be very careful and use the right products when doing any cleaning. 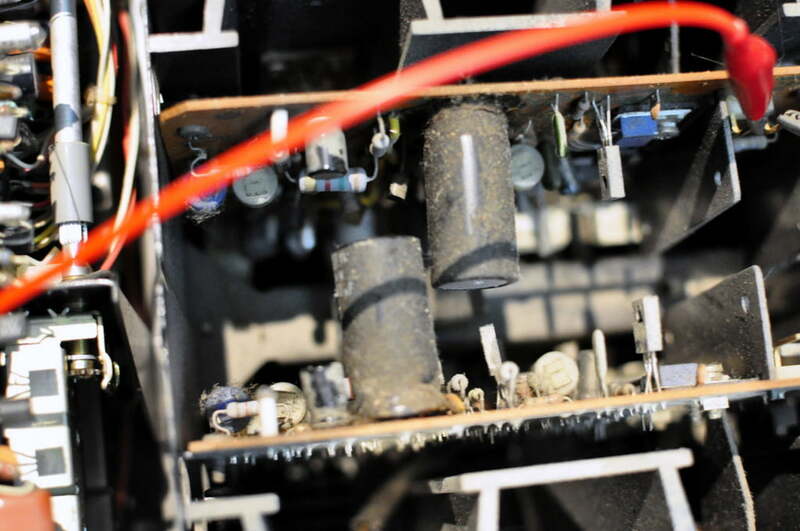 The ‘contact cleaners’ that people talk about in forums are usually not a good idea as cheap products can leave sticky residues that actually make things worse, and contaminate surrounding PCBs. I have a process that I use and specific products that I use as a part of that process. My process involves water and a laboratory foaming detergent cleaner, isopropyl alcohol and very specific laboratory contact cleaners and enhancers, depending on the application and type of pot. I’ve developed this process over lots of time spent working with test and measurement instruments. A lot of person are complaining about the fact that it is very hard to remove the glue used to secure the electrolytic capacitors. First I agree and sympatized with them. Second, there is a easy solution. The solvent that I use is toluol available at a hardware and auto parts store. This product is very flammable and the job should be done in a well ventilated area. Dip a Q-Tip in toluol and wet the area where the glue is located. Keep on doing it for five to seven minutes until it turns into a gel. I use a piece of pc board (5mm x 40mm) to scrape it off. Wipe the rest with a moist cloth or Q-Tip and the job is done. Yes, it is that easy and it saves a lot of elbow grease. I have the AU 717 on my work bench with a poping in the Phono section through the speakers. Nothing connected to Phono In. Of course it’s not acting up. I have the set hooked up to my oscilloscope for the past 2 hours. Have you seen (heard) of this problem. Hi Ron, I’ve experienced this happening with other amplifiers, dead or dying cap or maybe a bad semi. As always, check voltages and test the semis in this case. Worth checking or replacing any caps in this area too.. Mike. Thanks….my AU 717 is dead, im just about to pick it up as the fella reckons he’s unable to get parts for it. I prefer it to be going as i know it was a good unit…..but at what cost???? Definitely worth fixing, costs vary according to the issues present, but they are a nice amplifier and worth keeping in working condition. They don’t make them like this anymore! Hi, beautiful website and photos! My AU-717 (inherited from my dad) has a couple problems I’m trying to diagnose: 1. 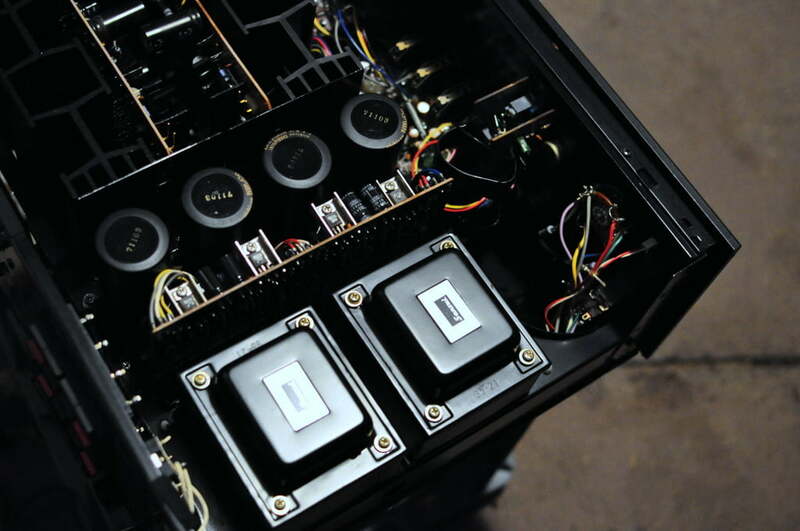 The speaker protection circuit takes forever to ‘click’ and send power to the speakers. Is this related to the relay? 2. The right channel sometimes doesn’t work when first turned on, but if I turn up the volume it often starts working, almost as if a clog were getting flushed out of a pipe. I’m guessing this is more of a capacitor issue? Fixing this stuff is really beyond my abilities, but I’d like to get educated before I pay someone to work on the amp. Thanks for your thoughts! Hi Mike, thanks for the positive feedback! It sounds like yours has the standard issues that come up and which indicate the need for a refurb or overhaul. There may well be a few dead caps, but I suggest you have her completely overhauled, which should include inspecting the boards for dry joints, cleaning and defluxing them, replacing caps, cleaning and lubing switches and controls and so on. This will ensure a long service life, post overhaul. Thanks for your reply, that sounds like the realistic approach for 40 year old electronics. I guess I’ll start saving my pennies and looking for someone in the San Francisco area who seems competent. I have one of these and recently had it serviced after almost 20 years in storage. The power protector light would intermittently start blinking and I would get static from the speakers. The tech said something about one of the power transformers needed replacing and cleanup. $150 and two months of trying to catch him in his shop later, it seemed the issue was resolved. And of course, as life would have it, three months later (after warranty) my issue is back. Now I have to turn the amp off and on several times before it stops making noise. I said all that to say, Is there anything I can do myself to alleviate my problem? Most of the electronics shops here in Wichita, KS are really IT oriented. Hi Nate, these problems are very common and it doesn’t sound like the cause would have been a power transformer. 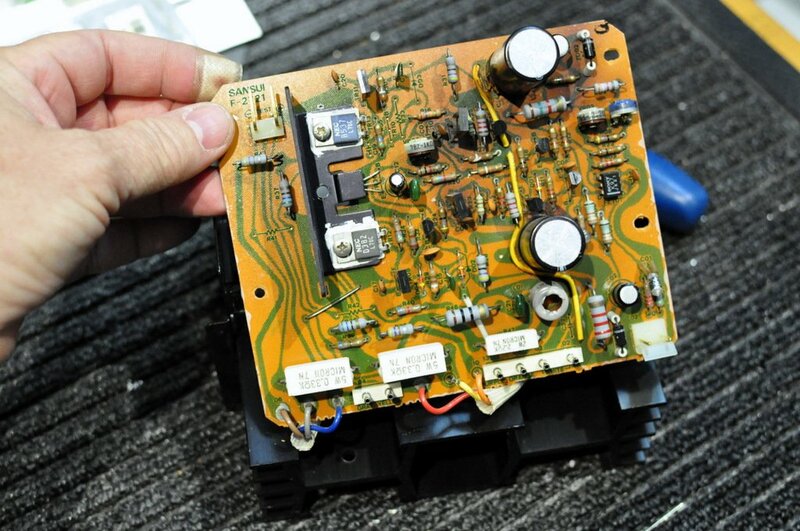 Usually it comes from the corrosive glue I describe in my article so this needs to be removed, especially,from,the protection and power supply board, which is the board with the large relay on it. 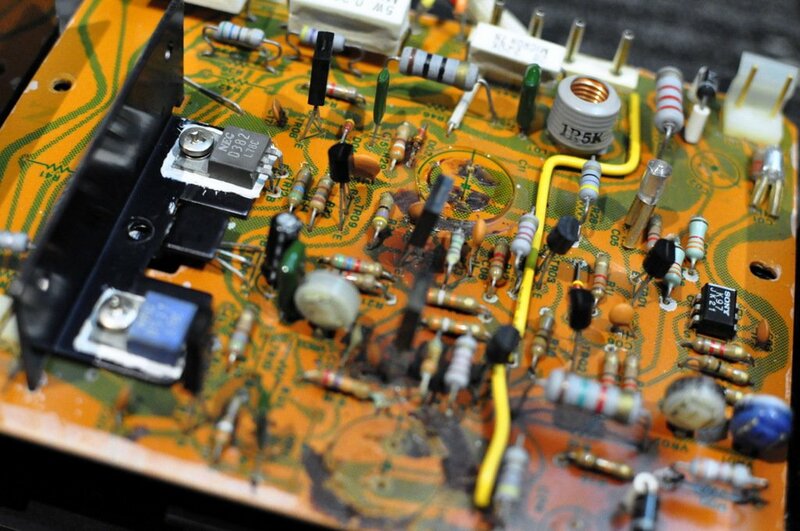 At the same time as you remove all that corrosive glue, change all the electrolytic capacitors on that board as well. This should help, along with cleaning all the controls with a high quality contact cleaner. Hi Fredrik, yes it works very well, but it involves several steps and these depend on what is being cleaned. For the chassis which I assume you are referring to, I use a foaming cleanser, followed by thorough flushing with water. Many people do not understand how to do this safely though, so I recommend only using this method at your own risk and if you have the ability to completely dry the chassis afterwards. Naturally then there are switch and control cleaning and lubrication steps and others for boards. I bought an AU-717 in 1978/79 (can’t remember exactly) and love it. About 10 years ago the left channel failed. I had it repaired but the problem resurfaced within 3 months. The repair shop tried again and it worked for 1-2 years and then the problem came back again. This problem suggests a capacitor issue or maybe a solder joint but I haven’t had the time or the equipment to tackle it. Is this something that you could take on and how much would you charge? Hello sir, I’m trying to repair my Sansui AU-4900 that I bought overseas about six months ago. At first I thought it was fun and normal, but after some time I found the Phono and AUX input is not working correctly. I cleaned the back input but the left channel in Phono often lost its signal, so I have to unplug and plug the RCA again and again to get it work. The problem seems almost similar in AUX, which sounds not balance when I use it. – What can I do to resolve the problems? – If I’d like to replace the carbon resistors (C.R. in Sansui manual), is it ok to replace the old ones with carbon film or metal film resistors which have similar specs? I’m new to this kind of thing and would like to learn how to solve the problems. Best regards from Manado, Indonesia. Hi Haygi, thanks for writing! Unfortunately this is not the sort of thing I can easily help with remotely. I need to really get the amp on my bench and then properly diagnose the problem and rectify it. This could be poor connection caused by corrosion, dry joints or some other problem. Further investigation definitely needed! In terms of the resistors, is there a reason you want to replace them? Yes, you can use carbon or metal film, no problem with either. Let me know if you have any other questions! Regards, Mike. Thanks for the advice, sir. I’ll try to inspect the unit again as soon as I can. I’d like to replace to old resistors because I already test the condition with multimeter. So far I found two resistors in the driver circuit board that might have to be replaced. After reading the manual and read about resistors, I think it’s a must to ‘refresh’ the amp, whether it would resolve the Phono/AUX problems or not. Maybe another parts also needs to be recapped. Thanks again sir, really appreciate your help. Hi Haygi, resistors are not something you would normally replace in a restoration. The only ones that would be suspect in an amp like this would be any high current/high power resistors that may have run hot for a long time. You’ll see these because the board around them will show signs of heat damage. Very often, these will be in the driver circuit. Replacing the others is not sensible or warranted in this kind of equipment. Have a good look at all the capacitors though! Make sure you are able to test them for C and ESR. this is not a true statement. 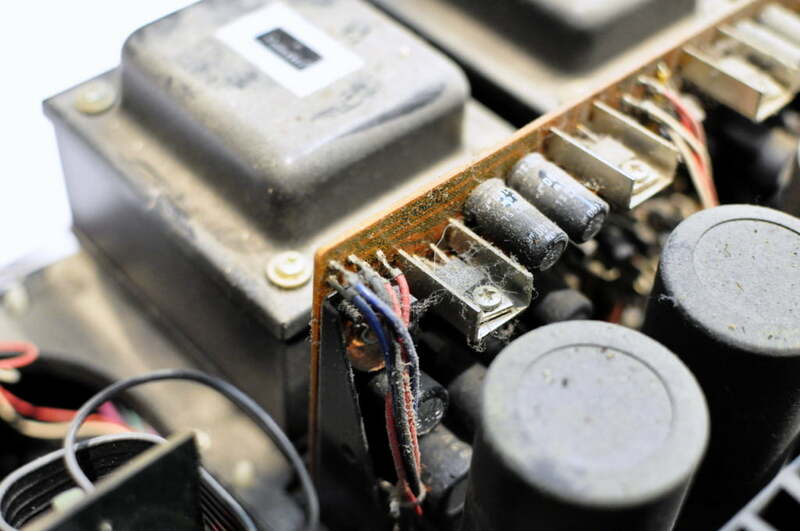 the fuse resistors on the driver boards need to be replaced. Thanks for commenting but I’m afraid yours is not a true statement! The question was about an AU-4900. Fuse resistors should be checked, like all parts. There’s a common myth out there however, perpetuated in forums, that they must all be replaced, without even being checked. This is not borne out by the many real examples I’ve worked on. In most cases they have been absolutely fine! Hello again, sir. Sorry for the late reply. I guess the driver circuit board have a lot of things to work on. The bottom side have signs of corrosion (or affected by hot temperature, maybe), and one of the resistors that I wanted to replace has a mark like it was burned. Then when I check it with multimeter, the result confirmed my conjecture. I’ll check the capacitors too, per your instructions. 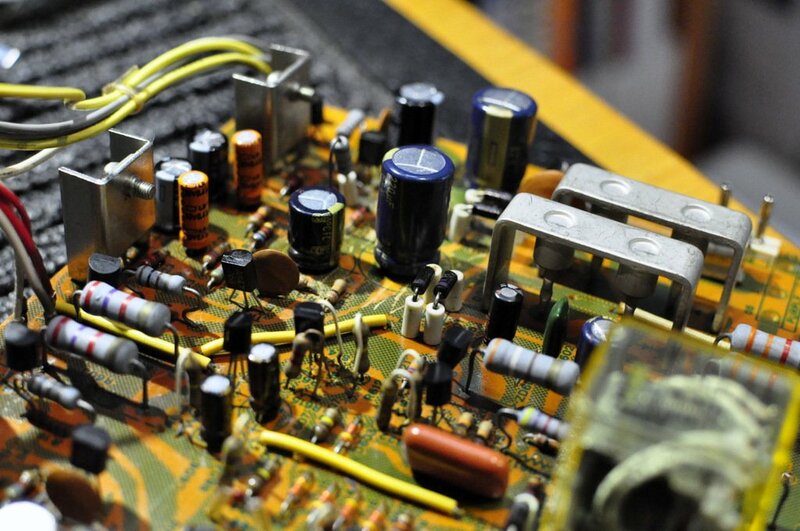 Btw, do you know where to order replacement circuit board for vintage amps like Sansui, Marantz, etc? I’ve tried searching on the internet but couldn’t find the right place. Thanks a lot for sharing your experience. Hi Haygi, yes a good plan to check and test everything. Replace burned resistors and test and replace caps as necessary. Remove corrosive glue where present and use a quality flux cleaner to improve the appearance of the boards. You cannot order replacement boards, they are long since out of production. It’s extremely rare to need a replacement board however. With care and the right techniques, almost any board can be restored. Remember it helps enormously to have high quality soldering and de-soldering tools. Okay sir, I’ll check them out and try to fix the amp to the best possible state. Thank you and cheers! hi mike i own a sansui 717 forever and my problem is that when i raise the volume around 27 stops working i used to play it hard but i miss all the fun can you tell me what is wrog or where to take it for repair am in temecula california thank you for been here. Thanks for the Sansui AU 717 this amplifier has fallen my way, the amplifier was sold to me on eBay…. couple years ago and its great to see it on Liquid audio..
Hi Dragan, thanks for commenting. So you are saying that you now own this exact unit? That’s amazing if so! I have the same Amp, and when I go to turn the volume up you can hardly hear anything unless I turn the volume up till the speakers pop then it all clears up, and then turn volume down to a level that’s suitable for listening. I was thinking that it could be the volume switch, but not sure. Where could I get a new volume switch if it is the problem? Thank you. Hi Paul, thanks for your enquiry. I’ve seen these problems many times and this is unlikely to be a problem with the volume control. Definitely don’t remove or try to replace it. I strongly suggest you get the unit in to me for a proper inspection. Do you live locally? Regards, Mike. Cool, well my pleasure regarding the advice and I hope you are able to find someone locally who can properly diagnose and repair her for you. These amplifiers are very serviceable and generally very reliable, though there are a few common points of failure. Try to find someone who’s had proven experience and success on amps like these. Let me know if there is anything else I can assist with. Mike thank you for taking time to reply! Ill search around for someone. Doubt if there is anyone in the area that works on these type of amps, but will check around. No problem Paul, I’d love to fix her for you, but distance is the killer in this case. Good luck getting this resolved. 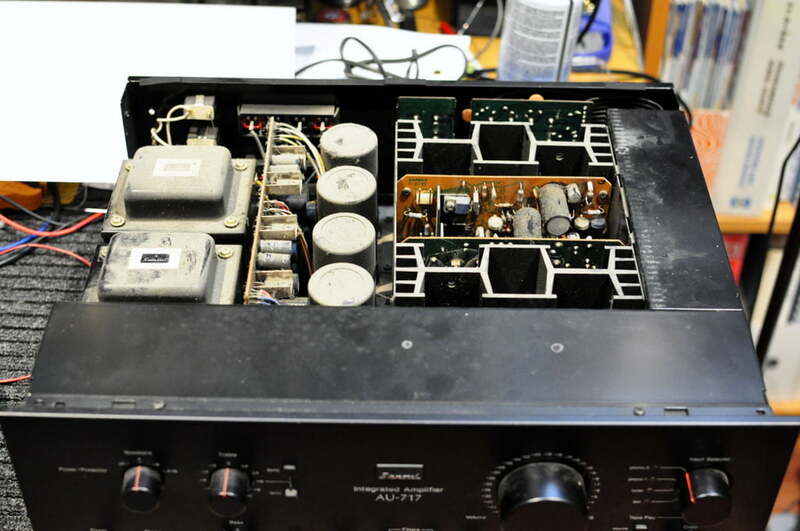 I have the same amp AU-717 and had it repaired by StereoAdvisor in Sacramento, California. They did a good job! Thanks very much for the suggestion Graham, I hope this helps my Californian readers! Hi Steve – it sounds like you might have a volume pot problem..? They rarely fail and with the correct approach they are usually very serviceable. Let me know if you require any assistance. If you are referring to the previous gentleman, faults where signals reappear at certain volume levels are usually protection relay related, especially in these units.